"Billions more for the NHS," is a familiar election battle cry. This time, the pledges from the main political parties have been much anticipated because of the warnings about mounting pressures on the service. Those commitments have now been made and, perhaps unsurprisingly, comparing them is like apples and pears. As always with public spending figures, there's a need to dig into the detail beneath the headlines to work out exactly what each party means. The financial headline from the Conservative manifesto is "£8bn more for the NHS". Party sources say there would be £8bn more spent on the NHS in England above inflation in 2022-23 than in the current financial year, 2017-18. That means new money is being promised. The £8bn figure bandied about at the time of the last election was the increase between 2015-16 and 2020-21. It appears that this is money for day-to-day spending and does not include capital investment. Thursday's announcement amounts to a rolling programme of annual spending increases rather than an immediate hike if Theresa May is returned to Downing Street. They imply slightly more in the next couple of years than had been previously pledged to the NHS and allow the Conservatives to say that spending per person will not fall (as had previously been thought). The spending rises would be funded, party sources say, through economic growth, with no specific tax hikes planned. Some extra revenue would come in through higher charges for overseas visitors using the NHS. Labour has promised, if elected, to add about £7.4bn to annual spending in England, including capital investment. 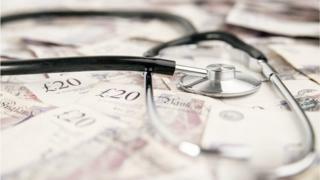 The money would be added to the overall Department of Health budget, which includes public health as well as NHS England. The big difference compared with the Conservatives is that Labour has identified tax increases to pay for the higher health spending, which in theory could be delivered immediately. Some doubts, though, have been expressed over whether the tax hikes can generate the revenues Labour predicts. The Liberal Democrats, like Labour, have promised a tax rise to pay for increased health spending. This, the party says, allows for a £4bn hike in the first year after the election. A one penny in the pound income tax increase will fund higher NHS and social care budgets. Given different assumptions and timeframes, it isn't easy to compare the plans. Anita Charlesworth, director of research and economics at the Health Foundation, has had a go. She has looked at existing plans up to 2020-21 for Department of Health spending for England and layered on the commitments made during this campaign. Her conclusion is that the new Conservative plans would see average annual real terms increases of 1.2%, rather than the 0.8% set out in the last spending review. Labour's plan in theory delivers annual increases of 2.2% and the Liberal Democrats' 1.8%. Ms Charlesworth argues that while there are sizable differences in the amounts promised by the parties, "none will match the spending increases of the past or rising pressures on the system, estimated to be 4% a year above inflation". Whoever is in government will need to face up to the fact that patient demand will continue to outstrip budget increases. Promoting better health and making the most efficient use of resources will still be priorities even with more money.